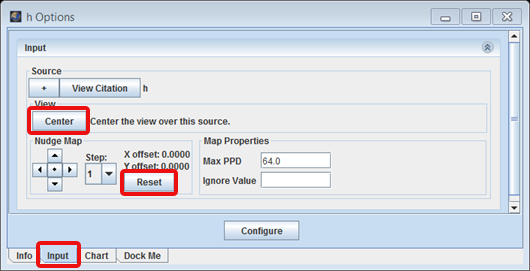 In order to start the process go to the "Add new Layer" in the Layer manager. 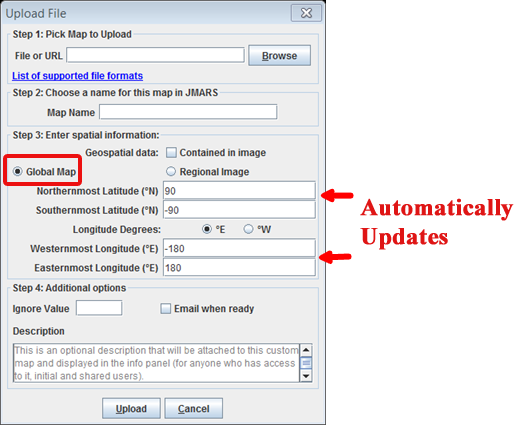 Then scroll down to "Upload Custom Map". This will open a new window to upload your image. In the second box, name your image. This name will appear on your newly created layer in your layer manager. -The first is Global Map upload. 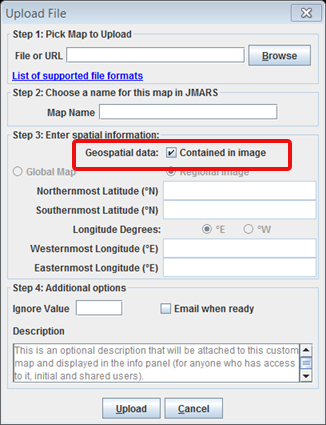 If your image is a global image, you can select the "Global Map" button. This will automatically fill in the corner points for you. 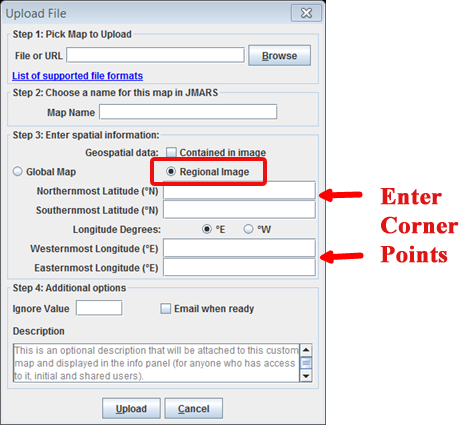 -The last option is to upload your image using the geospatial import button. Select the "contained in image" checkbox and then press upload. Again, this option will only work if your image has geospatial information and a projection. 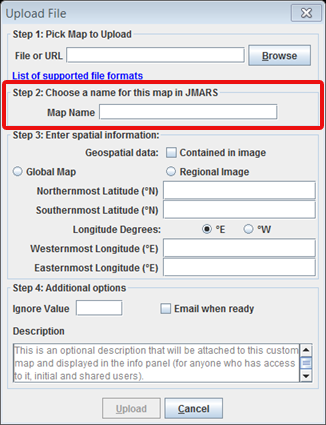 NOTE: As long as your image is recognized correctly by GDAL, the image can be a different projection other than JMARS. JMARS will convert it to an Equirectangular projection on the backend. Also, the image may take a an extended amount of time to upload if it is a larger image. Currently, images larger than 2G cannot be uploaded through this process. 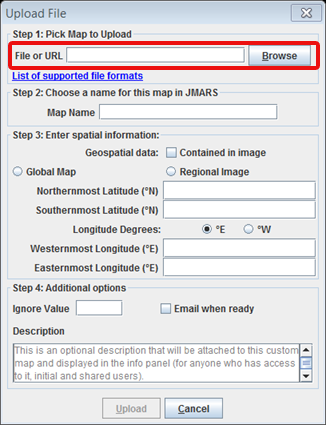 If you click "Center" JMARS will center over the image. Using the arrow keys in the "Input" window, you can shift the custom map in any direction by pixels. (Since the pixel number in the center of the arrows is set to "1", each click of an arrow will move the custom map in that direction by one pixel. To go back to the original position, click the "Reset" button next to the arrow keys to return the map to its original position. Navigate to the Advanced Maps and click it to open a new window. 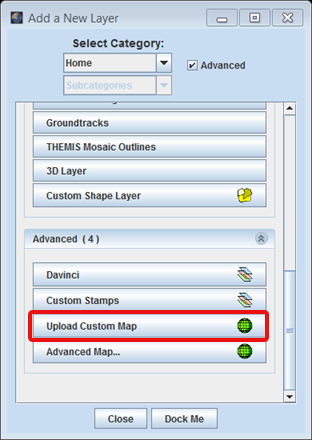 "Add New Layer" --> "Advanced Maps"
In the "Available Maps" section of the Settings window, under "Mars Spaceflight Facility Custom MapServer", click on the image you wish to permanently delete. Congratulations! You have finished the fifth JMARS tutorial!